Batavia, New York - Employment rates, government benefit program statistics, healthcare costs and starvation statistics are everywhere. While more than 14% of the population in New York State is living in poverty, the Global Education Committee (GEC) at Genesee Community College is doing more than facing the facts. 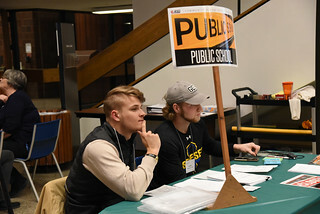 In the College’s nearly-full William W. Stuart Forum last week, the GEC hosted a very real simulation called “Disrupting Poverty” for students in Christine Belongia’s Teacher Education and Adolescent Development Classes, Karen Wicka’s Criminal Justice classes and Kari Heidemann’s and James Myers’ Human Services classes. 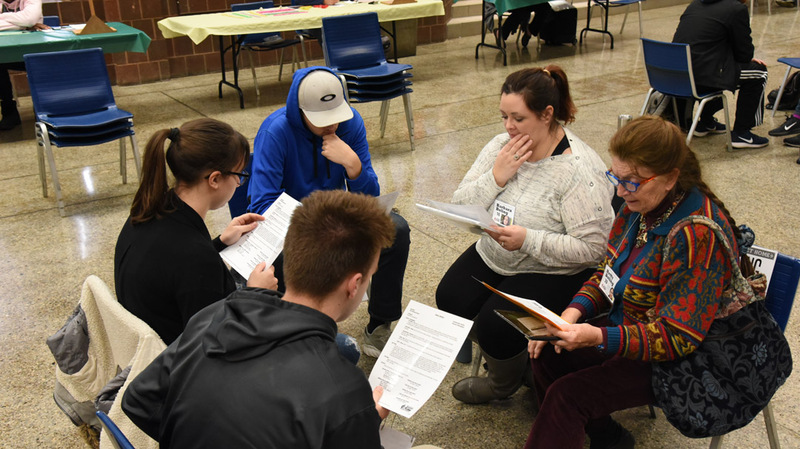 The simulation was designed by Missouri’s Community Action Poverty Simulation and facilitated by Juanita Henry, director of the Genesee Region Teacher Center and Pat Mullikin, director of the Tri-County Teacher Center. The poverty simulation positions several different family units, being role-played by GCC’s students, in the middle of a community typical of Genesee, Livingston, Orleans or Wyoming counties. During the one hour simulation, each of the family units must manage expenses, attend meetings and appointments, and struggle to meet the overwhelming needs of their family for one month, played out in a series of four fifteen-minute weeks. Each family unit is given detailed lists of bills that must be paid, restricted income statements and limited sources with the task of making hard choices to survive living in poverty. As in any community, there are resources and organizations available to the simulated family units that they can choose to visit – if they can afford transportation which was represented by having a paper “pass” bus ticket, cab voucher, or gas money for a friend or driver, all making the simulation even more realistic. More than a dozen different resources were represented in the simulation by role-playing GCC students. At one desk, a bank offering loans and cashing checks; at another, a child care center with daycare expenses; and another with an employer offering jobs with specific shifts available. In addition, as in the real world, other desks held pawn shops, healthcare offices, pay-day advance agencies who charge high interest rates, and or course, homeless shelters and other resources for the severely destitute. 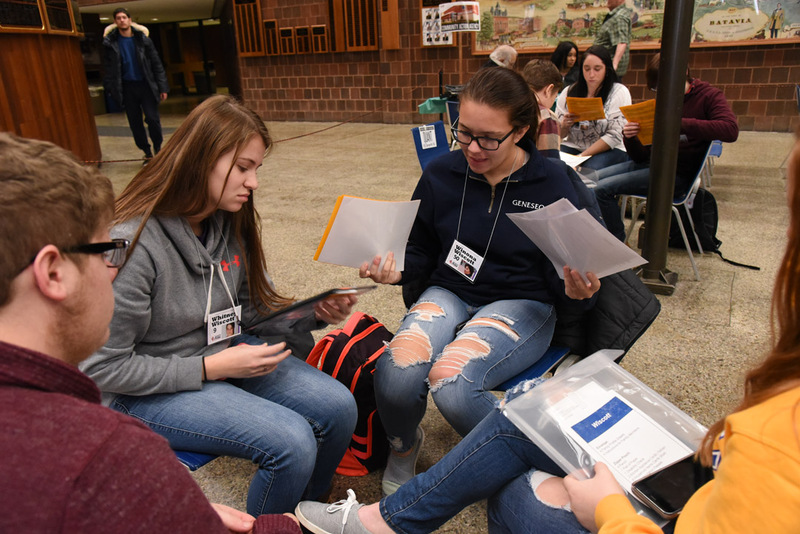 Throughout the simulation, students in the family units had to work together to plan and cover expenses, including food and shelter. “If we buy these groceries today, how will we pay for daycare next week,” one student asked his family unit. “My paycheck plus your social security check is only enough to cover rent and electricity this month.” The students in the family unit then researched their family situation and visited various organizations and resources to find ways to make ends meet. The program is part of this year’s Global Education, “Food and Cultural Identity” theme. Beyond activities such as this, the Adult Educational Opportunity Center (AEOC) at GCC works to address issues of food insecurity on campus every day offering a variety of classes and raising awareness of available resources, including GCC’s Food Pantry available to students year round.